What Day Of The Week Is August 8? 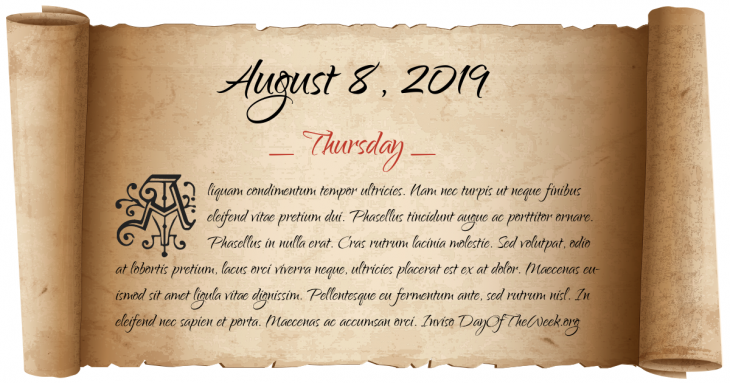 August 8, 2019 is the 220th day of the year 2019 in the Gregorian calendar. There are 145 days remaining until the end of the year. The day of the week is Thursday. King James IV of Scotland marries Margaret Tudor, daughter of King Henry VII of England at Holyrood Abbey, Edinburgh, Scotland. First flight of the Convair B-36, the world’s first mass-produce nuclear weapon delivery vehicle. Great Train Robbery: in England, a gang of 15 train robbers steal 2.6 million pounds in bank notes. 2008 Summer Olympics took place from the 8th August 2008-24th August 2008. The official opening ceremony started at 8:00pm on 8th August 2008. The number 8 is associated with prosperity and confidence in Chinese Culture and here it was a triple eight for the date and one extra for time (close to 08:08:08 pm). There were 28 sports and 302 events at the games. There were 43 new world records and 132 new Olympic records set at the 2008 Summer Olympics. An unprecedented 86 countries won at least one medal during the Games. Who were born on August 8?